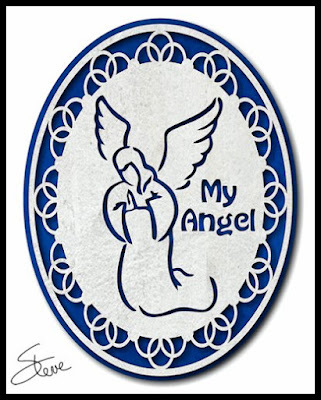 Painted Angel Scroll Saw Pattern. I don't use paint or stain very often. I decided this pattern looked better painted than natural wood. I optional paint colors I chose are blue for the backer board and white for the fretwork. I think white is the most appropriate for the angel but the backer board can be just about any color you like. Baltic birch plywood is probably the best choice for this project. 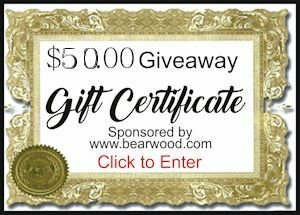 This giveaway will be a $50 gift certificate for Bear Woods. Home of Pegas scroll saw blades, clock parts, wood craft supplies and much more. Now featuring a small parts shipping option for cheaper shipping to the U.S.
You can enter the contest once per day. Contest ends 7/31/2017 midnight Easter time. If you need scroll saw blades make sure to check out the Pegas Modified Geometry blades at Bear Woods. I use them almost exclusively now. They are sharp and last a long time. They also tracker straighter. There is very little drift with these blades. Do yourself a favor and give them a try. When you open the contest page you will have to press the Click Here button to visit the Bear Woods web page. You will have to close that page and go back to the contest page to complete the entry. While you are on Bear Woods web page please support this sponsor and look at what they have to offer. Bookmark the page for future reference. Thanks for your support. 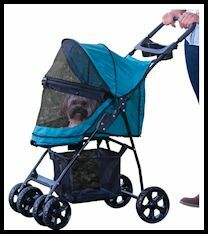 Please scroll below and read "From the Manufacturer" for exciting features.